Community Night at Provision Theater…It’s right here in our neighborhood! On Saturday night, March 16 at 8 pm, Connecting4Communites will be hosting a COMMUNITY NIGHT AT PROVISION THEATER located within walking distance or a short drive at 1001 Roosevelt Rd. (corner of Morgan and Roosevelt). A majority of our residents are not familiar with this little theater gem and we thought this would be a perfect event to introduce everyone. The Theater is devoted to producing works of hope, reconciliation and redemption; works that challenge us to explore a life of meaning and purpose. 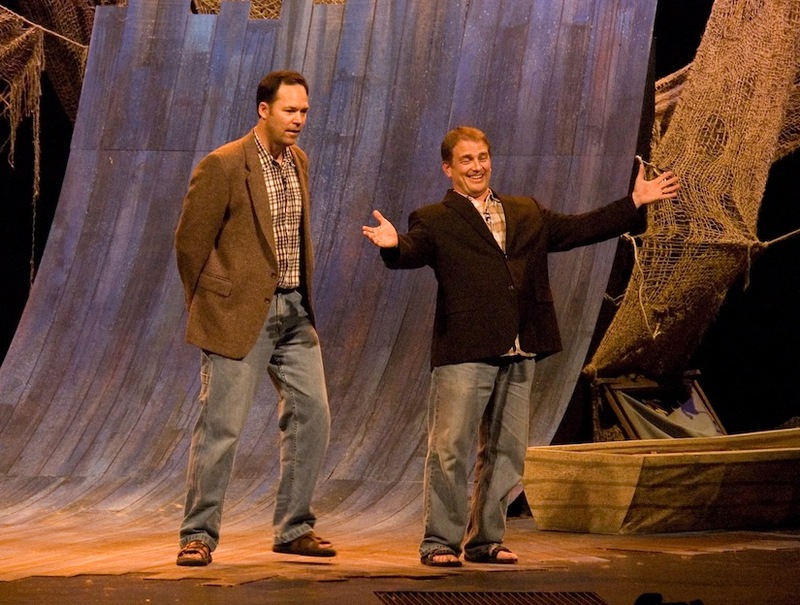 Provision Theater burst onto the Chicago theater scene in March 2004. Their productions have been nominated for Joseph Jefferson Awards and they have received critical praise from numerous publications such as the Chicago Tribune, Chicago Sun-Times, Chicago Reader and more. That evening we will be watching the production of FISH EYES, a humorous and poignant play about two brothers encountering a stranger who holds secrets to their future. They play, written by Lee Eschelman and Ted Swartz is based on the story of the apostles Peter and Andrew’s dynamic journey with Christ. FISH EYES is a modern retelling of this story, featuring two down on their luck brothers, Pete and Andy—two fisherman hoping for a “big catch” that will turn their lives around. The brothers are surprised when they encounter a stranger during their morning fishing expedition; sooner than later, they find themselves going on a journey with their new friend. The stranger is wise, charismatic and mysterious, but most importantly full of insight as to what their lives could one day become. The production stars Mark Demel as Pete and Provision ensemble. member Rod Armentrout as Andy, and is directed by Ingrid DeSanctis. There is a 10% discount for all community members for this March 16th performance. Tickets are $28.80 (regular $32) and can be purchased directly at http://www.provisiontheater.org/tickets.htm NOTE you must use code C4Cnight or you can call 312.455.0066. This discount is good for only the March 16th performance. Parking is FREE and you enter on Morgan. Please encourage your neighbors and friends to join us and discover what is in your own backyard! We look forward to seeing all of you there.